Inspired by Brandon Stanton of Humans in New York fame, she leads a group of volunteers to help the less fortunate on the streets of Rome. The volunteers deliver coffee, tea and personal supplies and they offer their time to visit with people living and working outside. Olivia has guided this project since September and has become friendly with some of the familiar faces she meets on her regular walks. Among the homeless and peddlers is an electrical engineer from Constantinople, a disabled man who scoots around the city sitting on a skateboard, and migrants from Senegal and Liberia who say they “have aged here” in Rome. Check out their stories on the Humans of Rome Facebook page. The bathroom bill in North Carolina got me thinking about the flexible public bathroom arrangements in Italy. Olivia’s school offers a good example: Upstairs near the library are segregated bathrooms for men and women, just as you would find in the U.S. Downstairs by the cafeteria, are two enclosed unisex stalls and one shared sink. Larger facilities such as the airport or the mall, usually offer separate bathrooms. However, it’s not unusual for segregated toilet space to feed into a common sink area. Smaller venues usually don’t segregate. Entrance to a shared bathroom. One room, segregated stalls, common sink. A final note about public bathrooms in Rome: Often there’s no toilet seat (I’ll spare you a photo) and a feature I love – foot peddles for flushing and controlling the sink water. Therapy most satisfying: A day with my divine (and not-so-sinful) friends. Eddie’s soccer tournament in Norcia. Cozy dining for 18 in Spello. Olivia’s cousin, Clara… weightless over Assisi. Hiking through olive groves near Assisi. Eddie – always chasing his soccer ball. A refugee boat banked on the grounds of the basilica in Assisi. The entrance to a convent near our apartment. Our roses in bloom on the terrace. George sparring with his Karate teacher. Uzbekistan – Lala’s school trip. 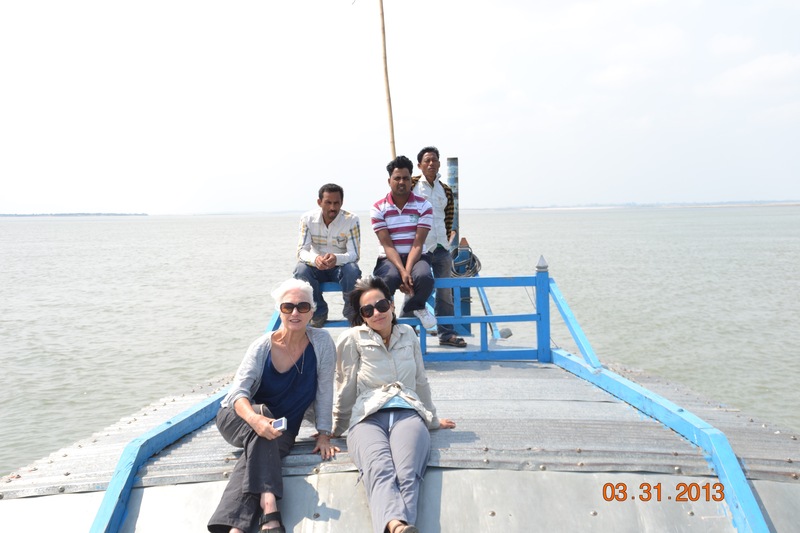 And a trip down memory lane: On the Brahmaputra River with mom.